What began as a best-selling novel by Robert James Waller and was adapted into film starring Meryl Streep and Clint Eastwood is now an irresistible, two-time Tony Award®-winning Broadway musical. The Bridges of Madison County tells the story of Iowa housewife Francesca Johnson and her life-changing, four-day whirlwind romance with traveling photographer Robert Kincaid. It’s an unforgettable story of two people caught between decision and desire, as a chance encounter becomes a second chance at so much more. Mary Callanan’s belting Broadway voice and big personality have earned her a large GLBT following, and she’s even admitted that when she volunteers and performs for benefits, her heart lies with the GLBT community (although she’ll do just about every benefit she can). Now Callanan joins the cast of Bridges of Madison County in the role of Francesca’s neighbor, Marge, who is firmly entrenched in the farm life of Winterset. Compared to other musicals, Bridges of Madison County is often described as being more intimate, passionate, and tender. How does that kind of dynamic alter the story-telling experience for the performers and audience? Mary Callanan: Our beautiful show is carried on the shoulders of a two-time Tony-winning score by Jason Robert Brown, which means the audience will be swept away with the lush music. The very nature of our show makes it an intimate evening, and watching this woman make potentially life-changing decisions can prove to be very emotional for both the actors and the audience. Oftentimes after the show, it’s very telling as we watch the audience leaving — I really would like to be in on their conversations! Having been a best-selling book and then a movie, what does the stage production add to that history or legacy of Bridges? MC: Our bookwriter, the Pulitzer Prize-winning Marsha Norman has filtered our version of this story through the eyes of Francesca, letting us perhaps understand the reasoning behind her life choices, what it must have been like as a war bride, leaving your homeland and moving to Iowa. It’s been nearly a quarter of a century since the book was a best-seller. What makes this story so enduring? MC: To quote another musical, it’s a “tale as old as time.” This story is most accurately described as a true love story, in all of its definitions: love of self, love of family, love of community, as well as passion! Your character of Marge has been called many things, from nosy and noisy, to fun and boisterous, and everything in between. How do you describe your character? What makes her so fun to play? MC: Nosy?! I prefer “concerned.” I love Marge because she’s like so many of us: she needs to know what’s going on in everyone’s business, but it all stems from a place of genuine love and concern for her friends and neighbors. Your character isn’t in the novel or the film, so what can audience expect to see your character add to the story? MC: Marsha added Marge and Charlie [Marge’s husband, played by David Hess) as a gateway for the audience. We represent how “we” all see what goes on in Bud, Francesca, and Robert’s world. Let’s face it, we all know a Marge (or are a Marge). I feel my character gives an outsider perspective on the world (next door). 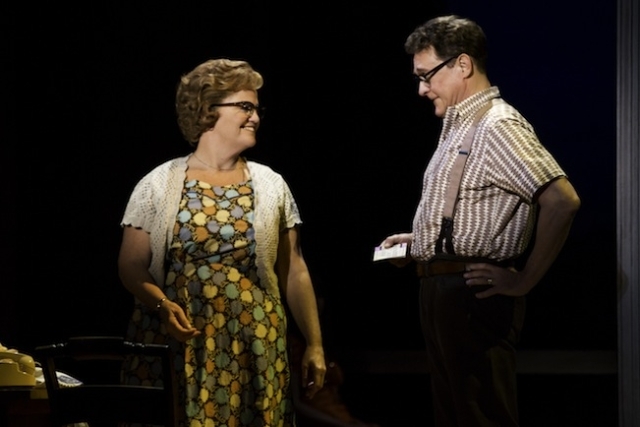 The Bridges of Madison County runs at the Orpheum Theatre through June 26. For more information and to purchase tickets, head to www.hennepintheatretrust.org.